Since its first season in 2007, Formula Drift Asia has been an event that drifting fans in the region look forward to every year for heart-thumping action. The race brings together drifting stars from around the world, from the US to across Asia, Australia and New Zealand. The event returned to Thailand last weekend after its last stop in 2010. 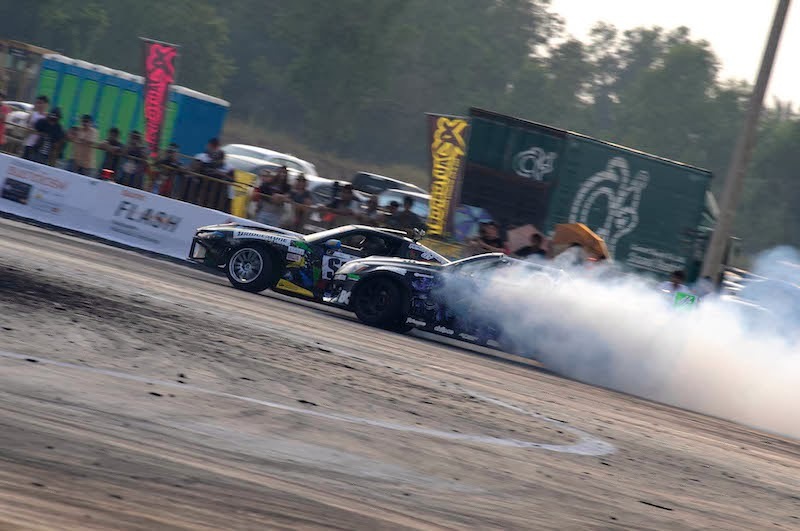 It was an assembly of international drifting stars at the Pathum-Thani Speedway with the likes of Daigo Saito, Kenshiro Gushi, Fredric Aasbo, Robbie Nishida, Josh Boettcher, and X-1R’s spokesperson and Prince of Drift, Tengku Djan. Of course, X-1R was in on the action with their own booth to showcase their products to the drifting fans. Also ubiquitous throughout the venue was X-1R’s statement yellow fans which Djan happily autographed for his fans. Djan passed the Qualifying round and Top 32 round with ease. Entering into the Top 16, he first came up against Aditya (Indonesia) who was no match on the tracks for our Malaysian drift hero. Djan’s next opponent was Ken Gushi (Japan). It was a close race between the two top drifters which led to four nail-biting rounds that saw Djan emerge as the eventual winner. Djan was then pitched against Daigo [email protected] Saito for the first time. The Ninja managed to beat the Prince, but Djan did not make it an easy win for him. The overall Champion for Formula Drift Thailand 2014 was Fredric Assbo (Norway), along with his trusty mean machine, a RS-R V8 Toyota GT86.